"It was definitely hard. I learned to manage my time," Wilson said. "I've always loved all three sports and didn't want to give any of them up." Bozzo said that "the days were long but I had fun." She, too, enjoyed being on the field or court and didn't mind the hard work and commitment needed to keep up with school and athletics. "You have to plan everything out and make sure you get it all done," Bozzo said. Three-sport athletes are a rarity these days. In the mid-1990s, athletes began focusing on one sport more and more, training year-round in an effort to secure a college scholarship. Bozzo and Wilson relished being in the minority. Bozzo played center back in soccer, starting all four years. In basketball, she saw some action as a sophomore and started as a junior and senior. A defender in lacrosse, Bozzo assumed a starting role as a ninth grader. Wilson, a center midfielder in soccer and a guard in basketball, also started. A shin injury kept her from being among the first 11 as a freshman. However, Wilson was called upon to sub in when the Lakers had big games. "Sarah and Alexa are two of the greatest kids I've ever coached," Mountain Lakes lacrosse coach Jen Munday said. "Their attitudes and work ethics are exceptional. If I wasn't coaching them, I'd go and see them play." 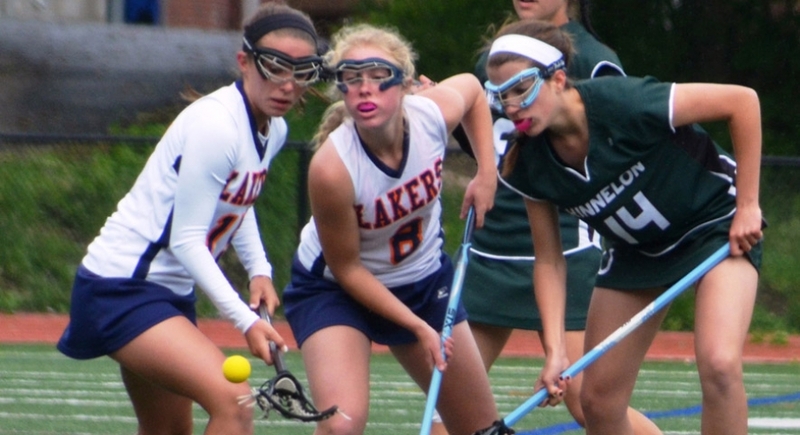 Both girls experienced the ultimate thrill last spring when the Lakers claimed the Morris County Lacrosse Tournament title. "Nothing compares to that," Wilson said. "It was great to win. I still remember the feelings after that game." Munday referred to Bozzo and Wilson as "great team defenders." According to Munday, Bozzo is more vocal and is always telling her teammates where they should be while Wilson is aggressive, the "I'll come-out-and-get-you type." Because of Wilson's speed and athleticism, she was assigned to the opposing team's best offensive player. It was their fathers who inspired Bozzo and Wilson to play multiple sports. Bozzo's father, Mike, played baseball and football in high school and was a member of the football squad at Columbia University. Wilson's family has a lengthy legacy in Mountain Lakes sports. Her grandfather, George Wilson, is a legendary basketball coach and took part in three sports. Bob Wilson, her father, participated in three sports in high school and was on the football and baseball teams at Princeton University. She wears No. 15, just like her father did. "Being involved in sports is a family tradition," said Alexa Wilson, a U.S. Lacrosse Academic All-America. "I followed in their footsteps and that made it special." Keeping up with schoolwork, particularly AP and honors classes, was a challenge. Bozzo, involved in numerous clubs, used study halls wisely and often went to teachers for help. Wilson, on the honor roll, disciplined herself and made sure she had time for homework. Her approach to academics and sports is the same: Aggressive. Bozzo, who will play only lacrosse at Franklin and Marshall, dropped field hockey and stuck with soccer once she got to high school. Her older sister, Jess, had played soccer. Another older sister, Chelsea, was on the swim team. "My sisters played sports so I grew up playing," said Bozzo, a captain of all three teams. "My dad and mom encouraged us to be active and wanted us to do our best." Although Bozzo was a standout in all three sports, lacrosse was her favorite. She took it up in fourth grade following her family's move from Morris Plains. She said Munday's influence made her passionate about lacrosse. She, too, gained Academic All-America honors. "I saw how much Coach Munday loved the game," Bozzo said. "There's a lot of Laker pride there. She pushed me to be the best I could be. I always was drawn to lacrosse because it's fast paced." Wilson is headed to USC to play lacrosse for Munday's sister, Lindsey, another three-sport student-athlete. Wilson was a softball player in the spring before switching to lacrosse as a seventh grader. Sister, Brenna, is at Briarcliff Middle School and favors basketball. "I wouldn't change anything if I had to do it all again," Wilson said of earning 12 letters. "Staying with all three sports was the right decision."